Approximately 39% of all dental injuries occur while playing sports and of those, 75% of sports-related dental injuries affect at least one of the most visible teeth in our smile. The most common sports-related dental injuries include broken teeth, knocked-out teeth, injured cheeks or tongue and even broken jaws. When should you wear a sports mouthguard? Although dental injuries are commonly associated generally with contact sports, such as football, rugby, hockey, and boxing, other dental and mouth injuries may also occur as a result of accidental contact with people or objects during other athletic activities, including skateboarding, basketball, soccer, squash, gymnastics, and Taekwon-Do. In essence, you need to be aware that all sports activities contain some element of risk that could result in a dental injury. At Parkview Dental we recommend that anyone who participates in athletic activities should protect their teeth with high quality, proper fitting sports mouthguard. A properly fitted sports mouthguard absorbs the shock of impacts. The mouthguard also protects teeth against potential chips, cracks, fractures, knock-out, and damage. A properly fitted sports mouthguard is an important equipment investment, especially when considering the cost of the potential dental work required to repair damaged teeth. For people who have to wear braces or other fixed orthodontic appliances, it is especially important to have a sports mouthguard that fits them properly. An impact to the mouth can damage the brackets and wires of the braces, and can also cause added cuts and tears to the soft tissue inside your mouth. How do sports mouthguards protect against dental injury? Sports mouthguards are dental appliances that fit over your teeth while you’re engaged in your sporting activity. If you are then struck in the mouth or jaw, the sports mouthguard helps to redistribute the force of that impact. A mouthguard also provides a barrier between your teeth and the soft tissue in and around your mouth. Many studies have shown that mouthguards help prevent chipped or broken teeth and protect against cuts to lips, gums, and other soft tissue in the mouth area. What types of sports mouthguards are available? Mouthguards vary regarding cost, comfort, and effectiveness. 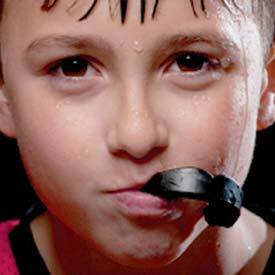 An ideal mouth guard is durable, resilient, and comfortable. It should fit properly, be easy to clean, and should not affect your ability to breathe. Less expensive sports store bought mouthguards can initially make you feel as though you’re protected from impact when in fact their protection is rather limited. Does the mouthguard offer sufficient protection and thickness in key areas? Is the mouthpiece not overly bulky? Does it allow for natural breathing? Does it retain its form? Is it odourless and tasteless? Common, off the shelf mouthguards that are available in sporting goods stores, may not meet any of these criteria — even if they are brand new! Also, once they have been used for a while by the athlete, and they are chewed out of their regular shape, this condition makes them even worse and offers even less protection. Despite this, over 90% of the mouth guards worn by athletes have been purchased at sporting goods stores. Mouthguards called boil & bite do have the potential to fit better. However, the actual fitting process itself has a downside. When biting into the hot mouth guard when it is malleable, the thickness of the mouthguard can be reduced and with it so is the level of protection provided. For all of your Brooks Sports Mouthguard needs, we welcome you to book a consultation appointment today. You can also discuss your sports mouthguard options at your next hygiene and check-up appointment — just ask! We look forward to hearing from you! no referral is ever required! Providing family and general dentistry to Brooks and Surrounding Areas for Over 30 Years! Disclaimer: Dr. Struan Vaughan, Dr. Earl Pierson, and Dr. Matt Cosman are Brooks General Dentists. They are not specialists in Cosmetic or Family Dentistry. Cosmetic Dentistry is not a specialty recognized by the Alberta Dental Association & College (ADA&C). Dr. Struan Vaughan, Dr. Earl Pierson, and Dr. Matt Cosman provide cosmetic dental procedures such as porcelain veneers, dental implant crowns, dental bonding, and teeth whitening as part of their General Dentist license. Dr. Struan Vaughan, Dr. Earl Pierson, and Dr. Matt Cosman provide General dental procedures for all ages within the family.